Editor’s note: Many of you may have seen Andrew Li’s excellent guest articles over the past couple months…well, we loved his work, and he loved doing it for us. So, we figured “why not add him to our staff?” So, welcome Andrew to the Bikecommuters.com team; in our tradition, here is his commuter profile for your reading pleasure. Since about 2001, I have been commuting by bike. By no means am I car-independent. I would say that about 30% of my commuting distance during these last 10 years has been by bicycle. I started pretty much out of necessity, in high-school. At that point, I did not have a car. So I carpooled, walked, or biked to school. 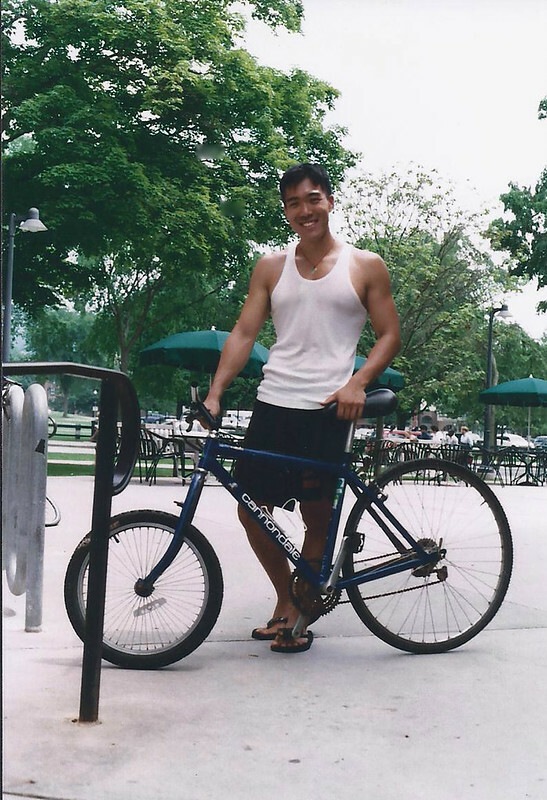 By my senior year, I realized how fast a bicycle could be, and so I adopted cycling as my primary mode of transportation all throughout college and medical school. Currently, my standard car-free commute is 20 miles, both directions combined. My longest car-free commute was about 32 miles, again, both directions combined. 1. Exercise (saves me a gym membership) and get somewhere I need to get to, all at the same time. 2. Saving me money not having to buy as much gas (check out the “commuter tools” tab on bikecommuters.com to see how much you can save by biking a few miles here and there). 3. Reduce my time sitting in traffic. a. I can’t tell you how many little shops and nooks I started noticing when I biked a route that I usually drove. b. And since I was on a bike, I was more willing to stop and explore on foot. 5. Appreciate my car more, and as such, when I must drive, I don’t get as frustrated when stuck in traffic. Fascinating cycle: I bike to avoid driving, and in the end, it makes me a better driver. 6. Value the food I eat and view it not merely for pleasure but more for its properties as a source of energy and means of improving my performance and health. I was quick to learn that a bad diet easily manifested itself in a weak and weary ride. 8. Cool topic of discussion at dinner parties. I am a general surgery resident, and live with my wife in Long Beach, CA. I bike from Long Beach to Torrance for my current commute. My first commuter was an old Taiwanese road bike that my dad bought in the 80s at a garage sale for $20. It was my first love and a real beauty. I rode that bike for about 8 years, until it was stolen. 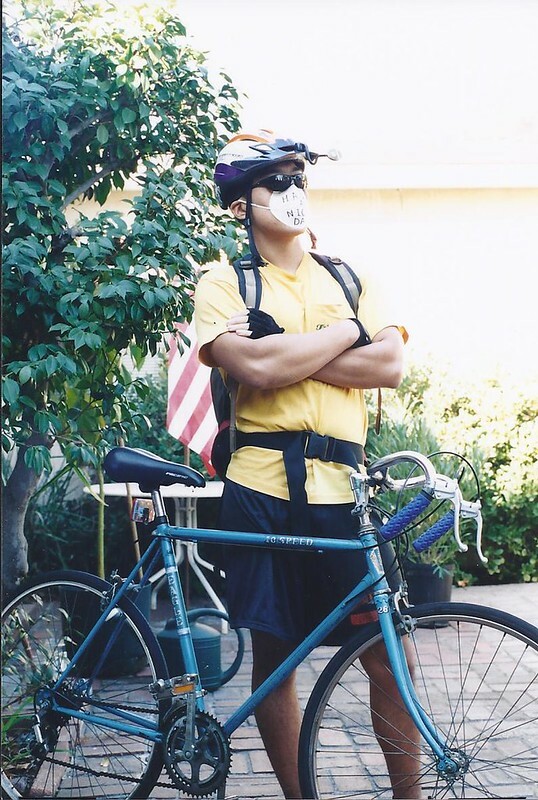 In this photo, I am wearing a mask because Southern California during that year was having a bad firestorm, and so the smoke from the fire was pretty noticeable. I had a beautiful Panasonic at one point, but we had to leave it when we moved away. In college, a friend bequested an old Cannondale to me. However, the front wheel got stolen. So I rummaged through our engineering department and found a BMX wheel that no one needed, and the clownbike was born (see first picture above). I rode that thing for about 2 years all around campus and beyond. Amazingly good handling (small wheels mean tighter turns). It got a LOT of attention, pointing fingers, and great laughs. Riding it, you just could not help but smile and laugh. I also called it the “happy bike.” As tradition dictated, I bequested it to a friend when I graduated. 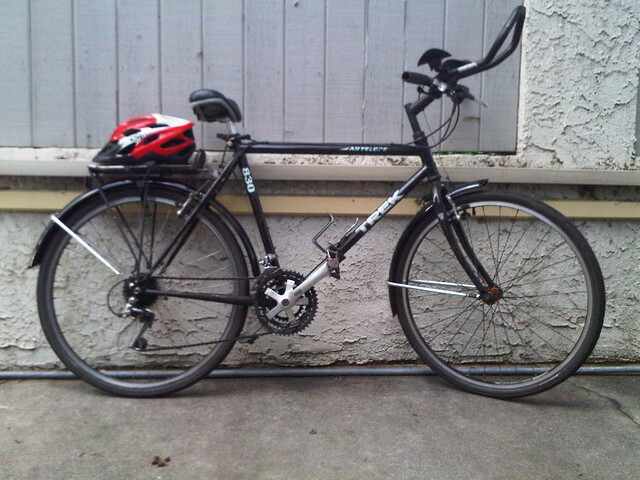 Currently I own an old Trek Antelope 830 with some simple personal modifications for my commute. Pretty robust so far. Some of the most interesting experiences for me were during my commute to one job I had in South Central Los Angeles (LA). The ride started in North Hollywood, and I saw the transitions from Valley suburbia, to decadent Hollywood Hills mansions, to the stark Business District and Downtown LA streets rushing with expensive cars, to South Central LA with its stretches of industrial compounds, schools with uniformed children laughing and playing behind high metal fences garnished with barbed wire, and the rattling homeless shopping carts. One of the most powerful memories I had during that commute was biking by two homeless guys fighting over a shopping cart filled with empty soda cans and about 50 others trying to break it up. As I rode by, one of them overturned the cart, and the sound of a hundred empty soda cans crashing on concrete and my bike tires crunching over them was overwhelming. They usually ask if I have ever gotten mugged before, as quite a few of my commutes have and currently go through rougher parts of town. Overall they are extremely supportive. I even converted one guy at my current work, and he is now a regular commuter. I have been getting involved with bikelongbeach.org. We are trying to get RL’s mobile bike repair unit getting started in Long Beach. I think I have gotten more tickets cycling than driving. Bienvenidos, Andrew…! Like your stories of various cheap bikes over time… and frankenbikes made of funny sized wheels. Safe travels in SoCalifornia Adventure land on those 20-30 mile commutes! I have a trek 940 made into a commuter, you cant beat these 90’s trek mtbs. Cheap, plentiful, and versatile. If I am buying a used bike I look for one of these.